Imagine trying to sleep in a noisy room, to eat healthy in a kitchen stocked full of treats, or attempting to be productive when everything else in your office seems to be urging you to relax and unwind. We try to play to our senses when it comes to making sure a room is serving its purpose. That’s why bedrooms are designed to be peaceful, while playrooms are often decorated from a bright, energetic point of view. A great way to create the desired ambiance in a room is with the perfect paint color. While it’s beneficial to choose colors that appeal to your tastes and complement your decor, it’s also important to understand how they can impact your state of mind. Choose the wrong color and you could throw off a room’s whole vibe. Select the perfect color and it will pull everything together. But how do you know what colors to choose? Here to explain how paint colors affect your mood and share their favorite room color ideas with you is Paintzen — a revolutionary service that makes it easy for you to get your home or office painted by a trustworthy painting pro at a price you can afford. Follow their brilliant tips, and you’ll create the ideal mood for your space in no time. For those of you who love to host, it’s important to keep gathering areas looking their best. 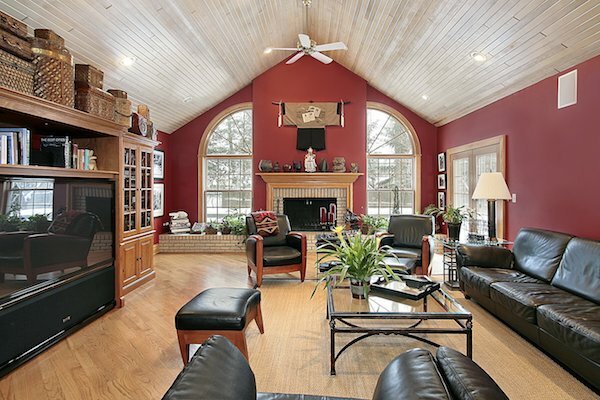 The foyer, living room, and dining room tend to be the highest-trafficked areas in the home for parties and events. When choosing a paint color, the best method here is to lean towards warm shades. From muted beiges to vibrant reds, warm colors will liven up your guests. Red will raise a room’s energy level, and studies have shown that it can even elevate heart rate a bit. So it’s a good choice when you want people to feel excited, to stimulate conversation, and to make an awesome first impression. Yellows and oranges are cheerful, energizing colors. And while some shades may be too vibrant to use on all four walls, adding an accent wall or a splash of color elsewhere will have a similar impact. Paintzen project, Upper East Side. Painted in Hale Navy by Benjamin Moore. Cool colors like blue, green, and purple have more of a tranquil effect on people’s moods. Blue has been voted the best paint color for bedrooms, given its soothing effects. It has also been known to slow heart rate and reduce blood pressure. While this is a good reason to use a shade of blue in a common area of your home, it’s a better choice for those areas where you go to escape. Green, too, is a restful shade, and is often associated with “feeling zen.” It’s refreshing without being overwhelming, and its association with nature helps create a peaceful environment. We also love green for bathrooms. What better color is there for a room where you spend time freshening up than a shade proven to help people feel cleansed? It’s no coincidence that MakeSpace’s free bins are the shade that signifies a clean, new beginning. Symbolic of the times when kings and emperors ruled, purple has always represented royalty and sophistication. This translates into the home, as well. The combination of warm red and cool blue creates a unique feeling that’s inspiring and elegant. Whether you use purple paint on all of your walls or as an eye-catching accent, it’s best used in places where you want to make a statement — like your dining room and entryway. It’s also a great choice for bedrooms if you want to make your personal space feel more luxurious. Regal metallics like gold and silver represent success and glamour. Adding a gold-leafed ceiling or subtle silver touches will give a room an air of opulence. For added drama, pair any of these colors with black to inject the space with a bit of mystery and authoritativeness. 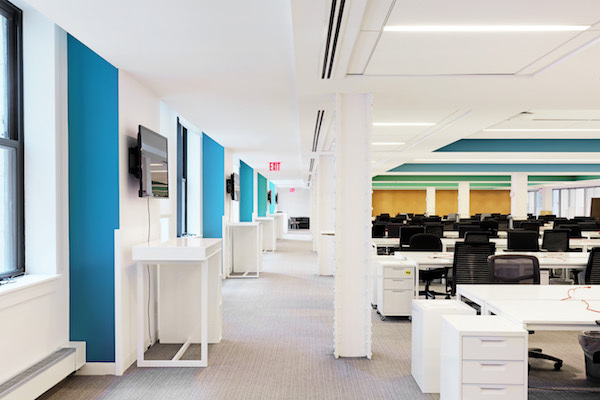 Paintzen project – This NYC office space was painted in various shades of blues and greens. When it comes to being productive, especially in a work setting, your profession will likely determine what the best office paint color is for you. For artists and others in creative fields, choosing colors like purple and lilac can help make you feel passionate and more intrigued by your work. Blues and greens have been shown to increase concentration and lower stress, so they’re excellent choices for high-pressure environments. Need to be extremely active? Try an orange or yellow accent wall. Because orange and yellow are invigorating colors, they’ll keep you feeling awake and energized. For that reason, these colors also work well in classrooms and gyms. 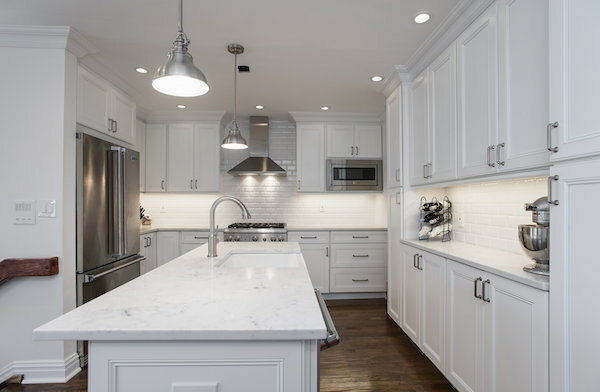 Paintzen project – A bright, welcoming New Jersey kitchen painted in Cloud White. Choosing white paint for your space is not taking the easy route. The perfect shade of white can completely transform a room. White represents purity, clarity, and an airiness that’s perfect for your home. When used as the primary color on walls, white makes a space feel clean and fresh. 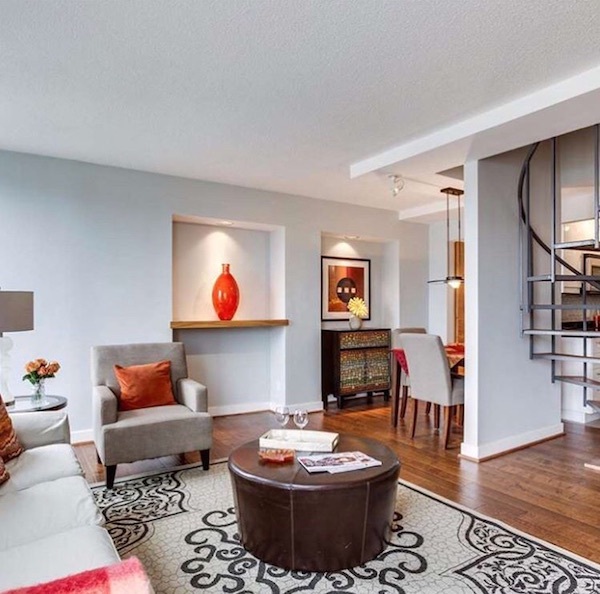 It’s ideal for helping small rooms feel more spacious. While it’s more difficult to clean, a bright white kitchen is crisp and inspiring, a perfect place to start your day. Just be sure to incorporate other colors, textures, and decor throughout the room because white paint can appear a bit stark or bland. You need to consider the lighting in your home or office. Between morning sunlight, evening moonlight, lamps, and other fixtures in your home, there are many different sources of light hitting your walls. There’s no right or wrong answer to this, it’s just important to understand how your wall color will be affected by light. Yellow bulbs will warm colors up, so be aware of this if you’re using yellows or beiges, as this will make a room feel even cozier. If you have a room painted in blue, green, gray, or white, and want to maintain that fresh feeling, consider bulbs that give off a bright white light, or as close to natural light as possible. Paintzen project – This Washington, DC living room painted in Balboa Mist gets plenty of natural sunlight. Overall, the paint color you choose for your home or office should reflect your personal preferences. You’re the one there most often, after all. But if you’re trying to achieve a certain vibe or feeling, tune into color psychology and use it as a guide to finding the perfect shade of paint for all of your rooms. Whether you’re ready to transform your space or just get a quick refresh, use Paintzen to make the process more seamless than ever. Get a fast, free painting quote online, and we’ll send a certified paint crew — along with all your paint and supplies — to your home in as soon as 24 hours. Plus, you can browse thousands of paint colors and get inspired by real rooms we’ve painted. Save $50 on your first project with promo code MAKESPACE. Visit www.paintzen.com to get started! This post was written by Paintzen, the only painting company that combines convenient online booking, high-quality paints, free color inspiration tools, competitive prices, and top-rated painters ready to start within 48 hours — all in a simple, one-stop solution for all of your home painting needs.